Lets face it ladies (and gentlemen!) coloring Asian hair can be challenging. The wrong color process can make our hair look brassy, make our skin look sallow, and can even damage our hair and make it turn an unflattering orange. Most of us have had a bad experience at the hair salon at least once. And many of us have a hard time articulating what look we want to our colorists. 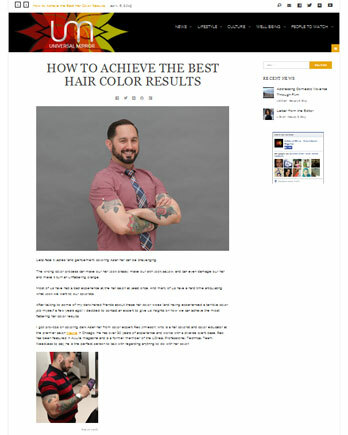 After talking to some of my dark-haired friends about these hair color woes (and having experienced a terrible color job myself a few years ago) I decided to contact an expert to give us insights on how we can achieve the most flattering hair color results. I got pro-tips on coloring dark Asian hair from color expert Rex Jimieson, who is a hair colorist and color educator at the premier salon Maxine in Chicago. He has over 20 years of experience and works with a diverse client base. Rex has been featured in Allure magazine and is a former member of the L’Oreal Professionel Technical Team. Needless to say, he is the perfect person to talk with regarding anything to do with hair color! Do Asians have fewer color options? R: “Those warm tones are [best in the] right amount. Don’t be afraid of warm tones! We don’t have to look like photographs! That’s what your hair does in the sun. That is nature’s beauty—it is something that should be enhanced. R: “Use a sulfate free shampoo/conditioner which is also color-locking. Balayage color processes don’t require much maintenance but you might want to do a glossing treatment after about eight weeks to maintain the look. Otherwise you might end up with [brassiness].